Lincoln 6ft x 5ft wall Kit. - Additional doors Both ends. Lincoln 6ft x 6ft wall Kit. - Additional doors Both ends. Lincoln 6ft Wide with 5ft wall. - Interior Wall with 32" Screen door ( As Door End). Lincoln 6ft wide with 6ft wall. - Interior Wall with 36" Screen door ( As Door End). Lincoln 8ft wide with 5ft wall. - Interior Wall with 36" Screen door ( As Door End). This Bench is manufactured from hand selected 100% Western Red Cedar with stainless steel fixings. 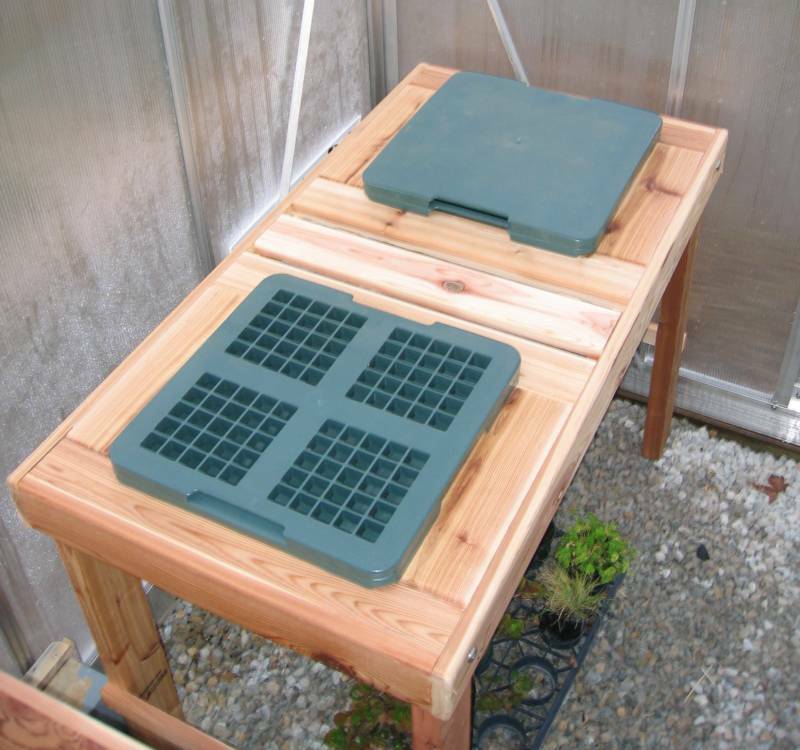 The bench has (2) 12" X 12" x 4" removable tubs with Lids and Grates. Size:-46-1/2"L X 24"W x 31"H.
Western Red Cedar with stainless steel fixings. 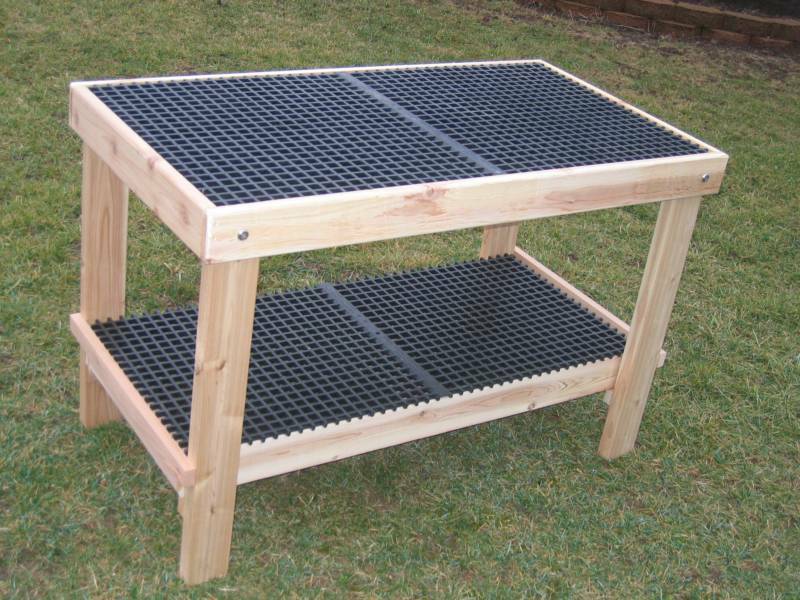 The top is a Polypropylene Grated Insert giving the bench a very rugged top surface. (bench shown with optional shelf). Size:-46-1/2"L X 24"W x 31"H.
Western Red Cedar frame with Polypropylene Grated top shelf Insert. Schaefer Variable Speed Shutter Fans with white PVC frame and vents. 12" :-115 Volts-0.9 Amp-760CFM. 16":-115/230 Volts-1.3/0.65 AMP-1250CFM. 12" &16" Motorized PVC Vent 115/230 Volt. 20":-115/230 Volts- 3.8/1.9 AMP-3122CFM. 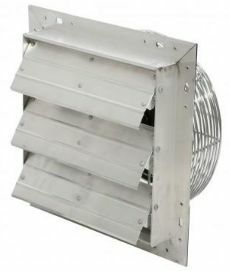 (3) Speed aluminum Shutter Fans and vents. 12" :-115 Volts-1.1 Amp-1115/855/555CFM. 16":-115 Volts-1.5 AMP-3000/2100/1300CFM. 12" &16" Motorized aluminum Vent 115/230 Volt. 20":-115/230 Volts- 3.8/1.9 AMP-3122CFM. Kit includes a (3) speed fan with a commercial-grade motor fitted with a 6ft cord. Fan speeds 2200/1400/1250CFM. Hang from the ceiling or stand on the floor (feet included). The 1/4HP motor is completely sealed with permanently lubricated ball bearings and thermal overload protection. this thermostat is ideal for use in the greenhouse the unit is waterproof. It is stible for both heating and cooling systems the temperature range is from 40F to 110F. Max capacity 120Vots-16AMP.